After spending most of the past week around Albufeira it was time to venture a little further along the coast. Alvor in the western Algarve, just past Portimão seemed like the ideal place. Alvor is a fishing village situated both on the coast and on the estuary of the river, Rio Alvor. What attracted me was the number of restaurants along the harbour with BBQs, all serving fresh fish of course. Alvor is a very pretty place with a stunning beach, walking along the harbour was equally enjoyable and choosing where to eat was very difficult as there was so much choice and many of them looked and smelled great. In the end we chose aLota which is just slightly off the harbour so didn’t have the views that some of the others did but the menu looked like it was written for me. We were brought the usual couvert of bread and olives but before tucking into the regular sardine pate I happened to notice a ‘tuna pate’ on the menu. I quickly ordered it and didn’t touch the bread again until it arrived. That was a very wise decision as the Tuna Pate was amazing, it was light and creamy and just fantastic. To start we ordered mussels and were very surprised when they arrived not having been debearded. Not just a couple of them that they’d missed but literally none of them had been debearded. I’ve eaten mussels all over the world and it’s the only time I have ever been served mussels that hadn’t been debearded. Thankfully we knew about them and could remove them ourselves before eating, i’m sure others won’t have been so lucky. 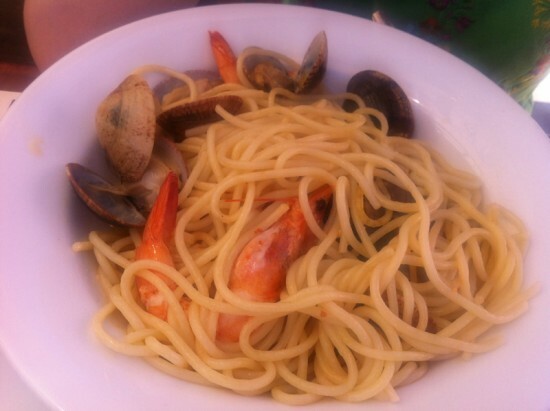 We also ordered Spaghetti with prawns & clams. The spaghetti was really well cooked and dressed with olive oil and a little lemon, it was really good pasta. The clams and prawns were good too, particularly the clams which were sweet, juicy and delicious. For main course I ordered ‘Surf & Turf’. 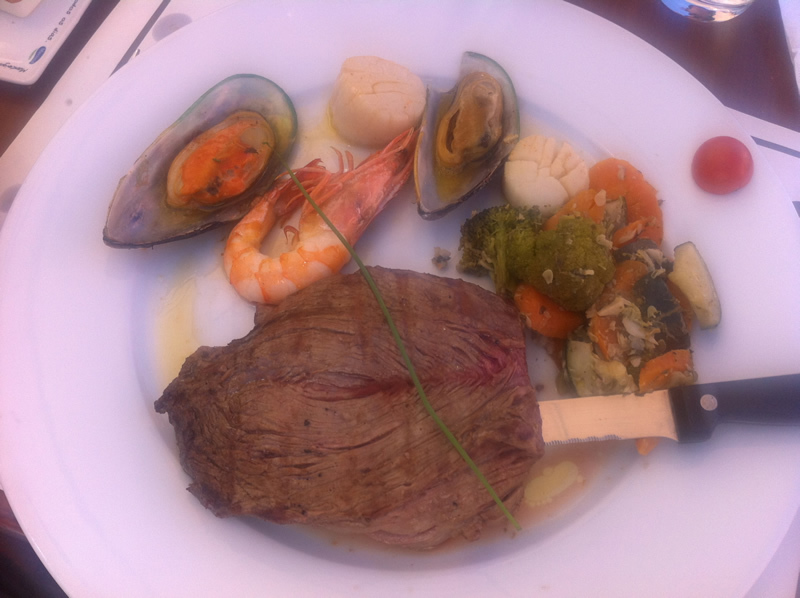 Portugese steak with a scallops, a couple more mussels and a prawn as well as cooked carrots, broccoli and courgette. The steak was fat and cooked perfectly so tender, juicy and tasty. The seafood was all cooked well. It was the first time i’d had scallops on the trip which made a change from all the prawns & mussels and these mussels were actually debearded. Unfortunately the vegetables were very badly overcooked and almost falling apart. 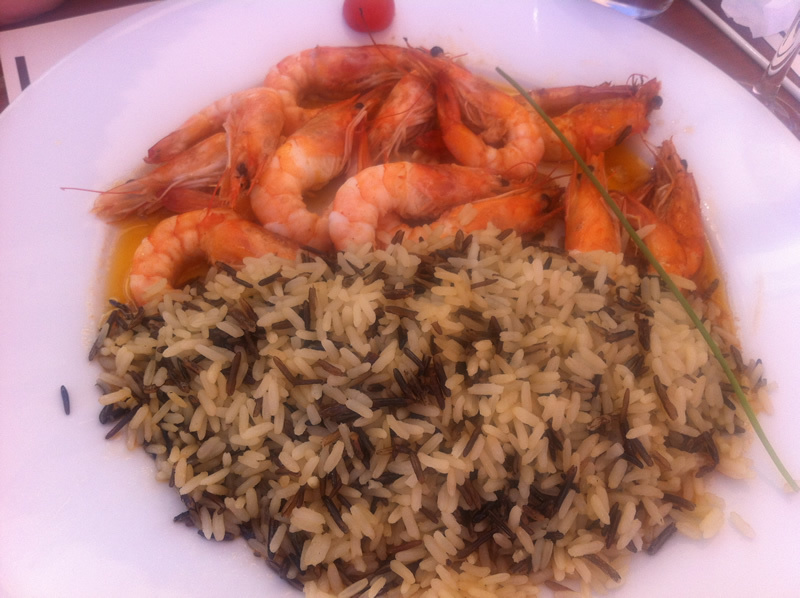 My partner ordered prawns with wild rice. Again the prawns were well cooked and the rice was really good. An excellent dish too. Service had been fine until this point but we waited a long time for the table to be cleared after main courses were finished and even longer for a dessert menu. Since it wasn’t particularly inspiring and we’d waited so long for it we decided not to bother with the desserts. It was a shame as apart from beards on the mussels and overcooked vegetables we’d had an excellent meal. The steak was one of the best i’d had and I will never forget the tuna pate. The house white wine was also very good and excellent value.